Two days ago, a former rodeo cowboy -- a barrel of a man -- said to me: "I tell you what, little sister. My first year, a man told me: 'I been to boot camp and shearin' school and shearin' school's harder.'" 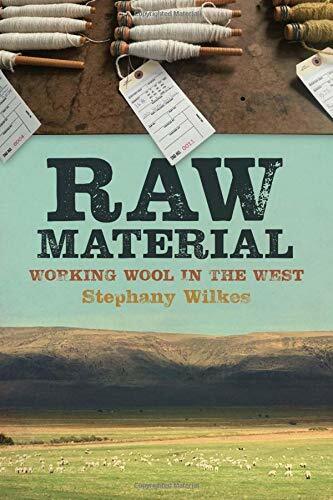 -- Raw Material: Working Wool in the West by Stephany Wilkes. I'm fascinated by Wilkes’s story of learning how to shear sheep and joining a growing community of eco-friendly wool producers. After shearing is complete and all fleeces sorted and graded, the wool is baled by grade, like with like. A higher grade brings a higher price for the seller, and explains why the skilled people who skirt fleeces and grade wool are so important: their work affects the grower's wool reputation long after the bales are gone. Learn more about Stephany Wilkes and her work with sheep and wool here at We Love Sheep. These are interesting quotes. I haven't read a book that covered this particular topic before. So thanks for mentioning this book. Sheep shearing really does look a difficult skill - not one I've ever been tempted to try, although I used to do spinning, which is also a difficult skill to master and I never did! Sounds very informative. Have a great weekend. Thank you for joining in!! Happy weekend! LOVE the cover on RAW MATERIAL. Well I bet shearing is not easy... I always marvel at how they can take the fleece off the sheep in one piece. Shearing is hard work. Sounds like an interesting read.